As some of you may know over the years I have had the opportunity to work with many rescue/shelters across the globe, from the large to the small, privately run shelters, this has given me a unique insight in to how different shelters operate. Most shelters (rightly so) focus on providing excellent welfare for the dogs in their care, however, dog training can sometimes be utilised, as a form of exercise and an energy sapping activity, instead of providing a focused initiative to train a dog to be successfully integrated to their prospective new home when the time comes. I think sometimes there is lack of focus on selection, correct training and introduction to a new owner, producing unsuccessful dogs in the community, that are not only unsuitable for the environment they live in, but more importantly require a level of handling that the average owner is unable to produce. This ultimately leads to unsuccessful adoptions and further stress on the dog. I AM GOING TO LET YOU IN TO A LITTLE SECRET, there is a place that in my opinion gets everything right with the dogs under their care. It’s a little know shelter in Champaign Illinois, USA, The Champaign Human Society. You see what makes this shelter different to the others I have worked with is it is not politically focused, it doesn’t import dogs to keep up with demand and aims to serve its community. Cleverly, the shelter also utilises the local veterinary University for interns, allowing them to research and implement the very latest shelter studies in order to achieve both superb welfare standards and enrichment programmes that are head and shoulders above every shelter I have visited. Like many shelters their focus is on both mind and body, but unlike many shelters I believe they achieve a higher standard, as the programmes are implemented intellectually, never being afraid of adapting or adjusting to produce the very best results. And the results? Everyone I met seemed to genuinely love what they were doing; the dogs were extremely happy (and quiet) in their kennels with music playing and a hive of activity ensuring the dogs were never too far away from human interaction, even when kennelled. The main point is this, while the average return rate for shelters runs at approx. 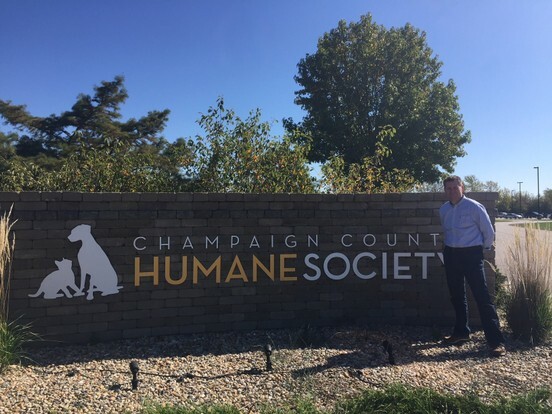 18%, Champaign Human Society runs at less than 10%, and I believe they are still working on getting this even lower, did I tell you they also have cats and rabbits? that they train these too? I could go on and on. If Carlsberg did rescues, this would be it, it’s that good!! Over the years I have experienced frustration by some of the top trainers in the world over shelter training and its impact on its community. I have often thought that if I won the lottery or came in to money how I would set up the perfect rescue. Because of Mary Tiefenbrunn and her excellent team, I no longer have to wonder and some of my frustration can turn to joy. So, for those who give to different dog charities, I challenge you to take another look at where your money is actually going and if in doubt you can always invest in the best or at least show your support on Facebook. Have a lovely Christmas and a fantastic New Year! !